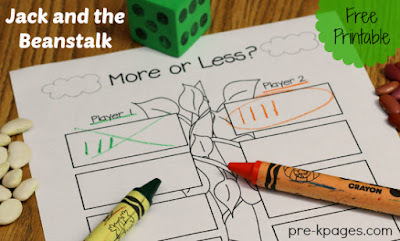 I recently had the opportunity to teach a math basal lesson to a class of kindergarteners on comparing two events and choosing which one would take more or less time. Midway through the lesson, I realized that some of the little darlings didn’t have a firm grasp on understanding the concepts of more and less. As I held two different sized water bottles (quickly grabbed at the spur of the moment) in my hands, I discovered they weren’t able to pick which one would take less time to fill with water. This lesson was taught at the pictorial level, but my observations suggested these children needed additional experiences with comparing more and less using concrete quantities. I discovered a post on HubPages which has teaching activities for more and less along with book suggestions. I love bears so I found Bear Wants More to be an appealing choice. I have other books in this series but was unable to find a copy of this one in a timely manner. As a result, I’ll be sharing Teddy Bear Ten Strips! Serendipitously, I came across the endearing book, I Wish You More by Amy Krouse Rosenthal and Tom Lichtenheld, which is filled with whimsical comparisons, at my nearest bookstore. The thought-provoking comparisons are somewhat abstract but can easily be followed up with concrete modeling, particularly for tug of war and pockets and treasures. The simple, repetitive text structure easily lends itself to pattern writing and a class book or dictating and a class chart. 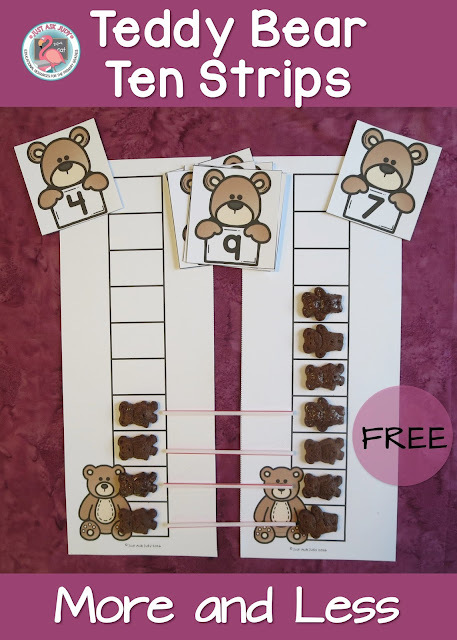 The Teddy Bear Ten Strip activity focuses on using one to one matching to figure out which of two quantities is more or less. This is a partner activity that can be enjoyed by an adult and child or two children. You can print on paper for one-time use or on card stock and laminate for durability. Print either the color or the black/ white teddy bear ten strips. Cut down the center of the page making two mats. Each participant needs one mat. Print and cut out either the color or the black/ white teddy bear number cards, if you are using. To have the possibility of equal, each participant needs one set of cards. Each participant rolls a die or picks a card, then places the corresponding number of counters on the ten strip, one counter in each space. Use plastic coffee stirrers or straws to show a one to one match. Who has more? Who has less? Repeat several times. 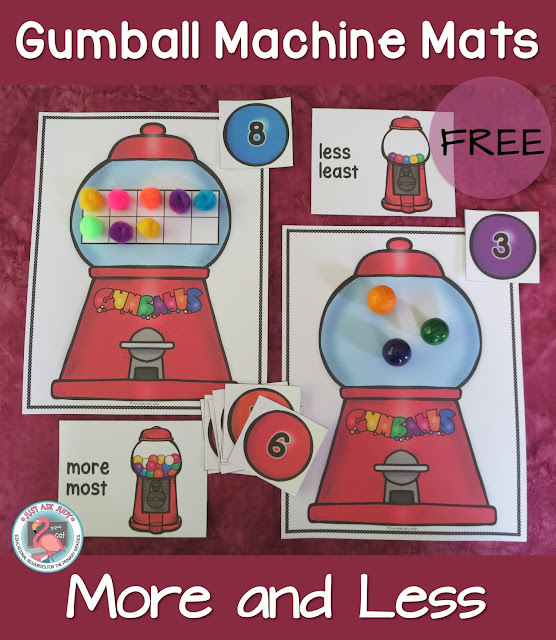 This next activity, Gumball Machine Mats, also uses concrete materials to decide which of two quantities is more or less but is a little less structured. It is another partner activity. Preparation is similar to the teddy bear ten strips. Just print one gumball machine mat for each participant, instead. Choose color or black/ white, with or without the ten frame. In addition, you may want to print the small comparison cards (cut apart, one set per pair of participants) and the anchor wall chart which provide visual cues. These are in color only. Each participant rolls a die or picks a card, then places the matching number of counters on the gumball machine mat. Use the comparison cards to show who has more and who has less. Then do it again! Be sure to download your copy of Teddy Bears and Gumballs, More or Less! 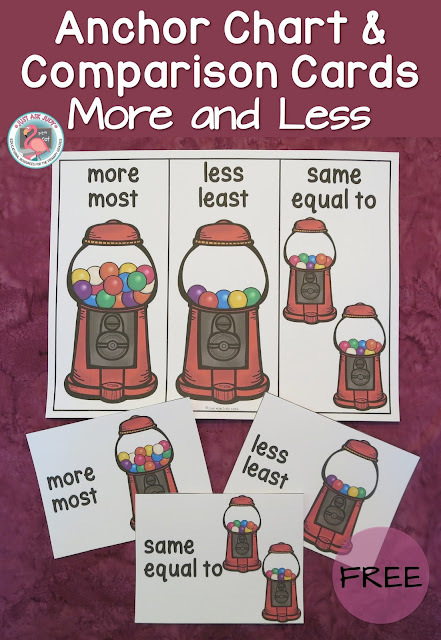 Check out another great hands-on activity for comparing groups of objects using the vocabulary more and less on the Pre-K Pages blog. This one will require knowledge of tally marks. As needed, teach more. Teach less. Then teach more and less. Break the task into small steps. As much as possible, have your math instruction flow from concrete to pictorial to abstract, keeping in mind that some children require more concrete experiences over a longer period of time. Use edibles and novel manipulatives to increase engagement. Repetition is essential for some children to learn. Repeat these activities, search for more, or create similar ones. Provide visual cues to illustrate concepts. Many children benefit from having something to “hang their learning on”. I used a similar anchor chart, with more vocabulary words, posted on a wall for easy reference, to provide support for second graders. 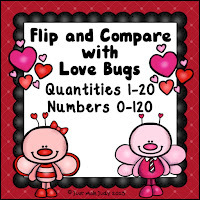 You might also be interested in these comparing resources available in my TpT store. 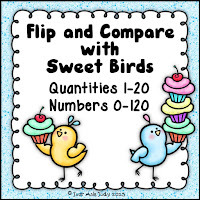 These have pictorial representations of quantities. Just click on the picture! Great information and so many freebies! Thanks! This is such a difficult concept for so many children! Love your visuals and hands on activities! I could not print the Teddy Bear ten strip, even after I pinned it. Click on the highlighted words “Teddy Bears and Gumballs, More or Less” in this blog post under the image. This should link to the Google Drive document. If this doesn’t work, just click on the Contact tab at the top of the page to let me know. All of the pages on the PDF are not working. I have tried on two different computers . Thank you for the heads-up and sorry for any inconvenience. I have replaced the file and all the pages appear to be loading now.